New healthcare entrants threaten the American $2.8 trillion healthcare market, they are poised to draw tens of billions with new products and services, much like what occurred in the publishing, banking and entertainment sectors, says a new PwC Health Research Institute report – Healthcare’s New Entrants: Who will be the industry’s Amazon.com? According to the Health Research Institute (HRI), US consumers are ready and willing to embrace new options under development by new healthcare entrants from the telecommunications, technology, and retail sectors, from online evaluations of digital photos of rashes to smartphone otoscopes. 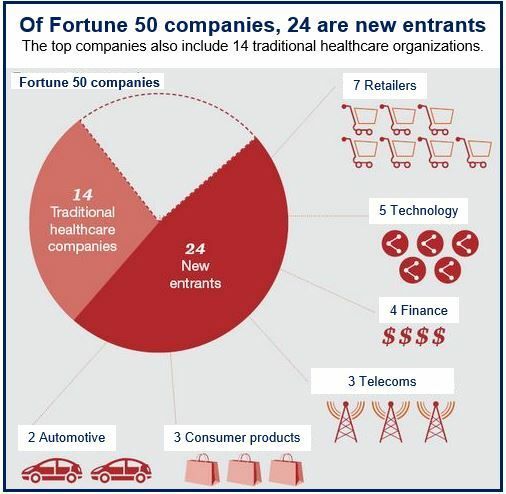 Approximately 50% of all Fortune 50 companies in 2013 are new healthcare entrants, including eight technology and telecoms companies, two automakers, and seven retailers. 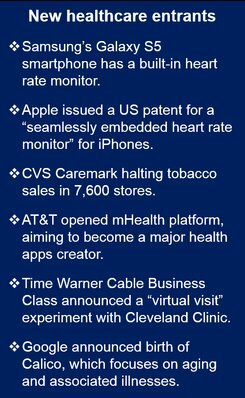 They are simultaneously muscling into America’s $2.8 trillion healthcare market. The researchers calculate that the US market for wellness and fitness products and services adds a further $267 billion to US health spending. New entrants are aggressively pursuing this sector, which is awash with startups and willing venture capitalists. When these two markets are added together, Americans probably spend more than $3 trillion each year on health. New healthcare entrants want a piece of the $2.8 trillion pie, while other aim to entice customers to new parts of their business with quality healthcare. HRI has published the results of a survey carried out in December 2013 that identified the health diagnostics, treatments and services market as being at very high risk of becoming overwhelmed by new entrants. The authors say this sector has a large number of consumers who are keenly seeking out competitively priced health solutions from non-traditional sources. This market, estimated to be worth $64 billion, “is just the tip of the iceberg,” the report suggests. In the survey, participants (respondents) were presented with a range of common medical treatments, test and procedures that were offered in new settings, such as an online doctor evaluating a digital photograph of a rash, or using a strep self-test kit at home. When asked whether they would consider using any of the alternative treatments, services or products if they cost less out of pocket, almost half of respondents responded “Yes”. More than half said they would choose using a smartphone device to examine and diagnose a rash with a smartphone and then sending the photo to a doctor online, while over one-third would even consider more sophisticated options, such as infusion therapies.